Consequently, you are no longer foreigners and strangers, but fellow citizens with God's people and also members of his household, built on the foundation of the apostles and prophets, with Christ Jesus himself as the chief cornerstone. In him the whole building is joined together and rises to become a holy temple in the Lord And in him you too are being built together to become a dwelling in which God lives by his Spirit. 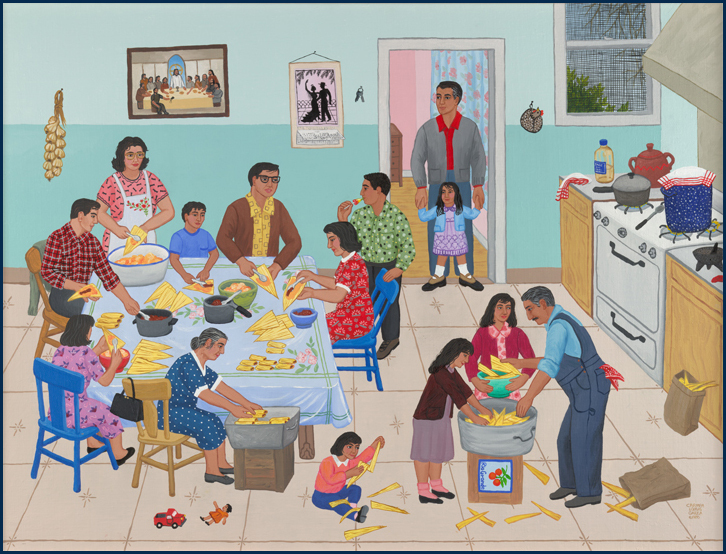 Carmen Lomas Garza's work is filled with scenes & scenarios of every day life. Her depictions of family resonate with many. 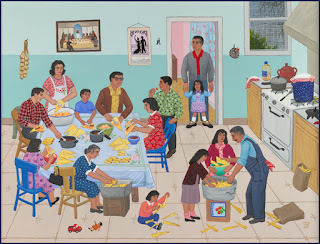 I catch myself smiling at the vignettes within her work that remind me of my own upbringing. The culture, location, and activities may be different, but the heart is the same. Family comes together in good times & in bad times. They are their to listen, encourage, challenge, support, teach, direct, work, laugh, and love. Families may not always agree, but they will be there for one another. With such a support system, great things can happen when family functions as it should. God's family is no different. We don't all look, act, think, or do things the same. However, when we come together....AS WE ARE SUPPOSE TO...God can do amazing things in & through us. As brothers and sisters in Christ, we should seize every opportunity to work as one. When we bring our gifts & talents together for the glory of God's kingdom, amazing things can happen. The children of God need to be building bridges & not looking for ways to divide. It doesn't matter the name on the outside of the building, if we are traditional or modern, or if we use KJV or NIV. If we'd come together and listen, encourage, challenge, support, teach, direct, work, laugh and love TOGETHER...this world would be such a better place. If we kept the main thing....THE MAIN THING... KNOW GOD & MAKE HIM KNOWN...the rest would come out in the wash! In the essentials we must have unity, but in the non-essentials....GRACE. God has created us to be a family for a reason! He wants to be in the midst of us. He wants us to work as one. Seems like a great idea, but not always so easy to practice...and that is a perfect lead in for our prayer this week! Dear Father, we want to be who you created us to be...a brother/sister. We want to be how you intended us to be...a family! We allow so many things to get in the way of this. Lord please help us to come together as one. Help us to put aside our thoughts, agendas, and our pride that so often get in the way of us acting like a true family. Help us to be the ones that will spark change, build bridges, and encourage the body of Christ to work as one! For Your glory...and Your honor.